Eleven-year-old boy, who was hit by a truck last night, succumbed to his injuries this morning. The deceased was identified as Toofan Ali. His brother Zohar Ali said Toofan had suffered serious head injuries. He said his brother was playing near a fuel station in Shiv Colony, when the truck, heading towards Jalandhar, ran over him. He was rushed to the hospital, where he succumbed to his injuries. The police have recorded the statement of the victim’s relatives and were in process of registering a case against the truck driver. Toofan was staying with his father Saseed Ali in a shanty at Shiv Colony. He was the youngest of the seven siblings. Parvez, a social worker, said the area was home to 600 Muslim families. “There are no playgrounds or parks here. Our children play alongside roads. The area lacks basic amenities. Nothing has been done to uplift us. This is not the first incident. A number of children have become a victim of speeding vehicles,” said Parvez. “Registering a case or nabbing the driver won’t help. Parks should be developed,” said Parvez. Toofan’s mother was inconsolable.All his siblings are helping his father in business. The police have impounded the truck. A seven-month pregnant woman became a victim of domestic violence. The victim, identified as Menu, who was rushed to the Civil Hospital after being thrashed by her husband Sunny Sachdeva, a resident of Harcharan Nagar. She said her in-laws were pestering her to bring more dowry. When she refused her husband, along with his parents, thrashed her and threw her out of the house. The police have received the complaint and started investigations. An undertrial was stabbed by his fellow inmates in the Central Jail today. The accused, Mohd Noor Hassan (38) of Rahon Road, who was arrested in a drug peddling case and was sent to jail, was taken to the hospital for medical examination. Noor Hassan said he always stopped his fellow inmates from consuming drugs inside the barrack. “In the morning, when the inmates failed to find drugs, they attacked me,” said Noor Hassan. Jail superintendent SP Khanna said the inmates fought over a petty issue which had been given a different colour. Five students of Government Model School, Punjab Agricultural University (PAU), suffered injuries after the van they were travelling in was hit by a bus belonging to an engineering institute today. The incident took place outside Gate No. 4 of the PAU. 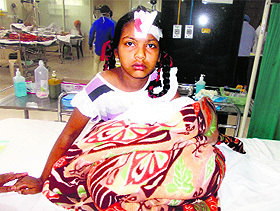 One of the injured students, identified as Sneha, was rushed to Dayanand Medical College and Hospital. She has sustained multiple injuries on her head, legs and an arm. Investigating officer Gurpreet Singh said the van was entering the university from the Lions Bhawan side when the bus belonging to the Institute of Engineering and Technology, Bhaddal, heading towards Rajpura Road, hit it. It was learnt that the van driver applied brakes in order to avoid collision with a speeding vehicle. The bus driver, who was following the speeding vehicle, could not apply brakes on time and hit the van. Four other students, who had also suffered injuries, were administered first-aid. Later, they were sent home. The investigating officer said action would be taken after recording the victim’s statement. A race between two cars left three persons seriously injured in the Salem Tabri area. A Maruti Swift car that was reportedly hit by a Toyota Innova crashed into a divider, tossed into the air and landed in a public park. The three injured, identified as Sahil, Sajan and Sunny, were rushed to the hospital. The trio’s condition was stated to be serious. The driver of Toyota Innova managed to flee. The incident took place around 11.15 pm when Maruti Swift car, in which the trio was travelling, reached Elevated Road near Jagraon Bridge. When both the vehicles reached near the New Sabzi Mandi area in Salem Tabri, the driver of Toyota Innova reportedly hit Maruti Swift. The car driver reportedly lost control over the vehicle and crashed into a divider. The police reached the spot. The investigating officer said overspeeding led to the mishap. He said statements would be recorded shortly. An extended spell of rain, which lashed the city in the wee hours and continued intermittently till late morning, inundated many city localities, with commuters, especially schoolchildren, being at the receiving end. In low-lying areas, rainwater entered houses and commercial establishments, adding to the woes of residents. In some localities, backflow of waste water from sewer lines due to the poor drainage system was reported. Overflowing sewage worsened the situation. As the downpour continued relentlessly for quite some time, most of the main roads in the old city area as well in some of the posh localities looked like water bodies. Old GT Road (from the railway station to Clock Tower) and Ferozepur Road (near MBD Mall) were under water. Ditto was the situation in Sarabha Nagar, parts of BRS Nagar, Dugri, Ghumar Mandi, Maharani Jhansi Road, Guru Nanakpura, Haibowal, Old DMC Road, Model Gram, Dholewal and many areas in old city including Chaura Bazar, Saban Bazar, Talab Bazar, Gokal Road, Neemwala Chowk, Field Ganj, Shingar Road and Old Jail Road. The administration was under fire for poor drainage network, inadequate sewer lines and particularly for its failure to clean up drains (nullahs) flowing through many parts of the old city. Parminder Mehta, spokesperson for Congress councillors, said even though a storm water sewer had been laid in commercial hubs of the old city such as Chaura Bazar and Saban Bazar, since the MC authorities had failed to clean up the nullah flowing through Talab Bazar, the areas had to face the fury of accumulated rain water. Prateek Gupta, a resident of Sarabha Nagar, said water-logged roads in posh localities, including parts of Sarabha Nagar, spoke volumes of the lack of preparedness for the rainy season on the part of the civic administration. “Inadequate and clogged sewer network in the area was not cleaned up with the result that rainwater had nowhere to go, except accumulating on roads and streets,” he said. The city received 44.61 mm of rainfall today. The torrential rain was a blend of joy and misery rainfall. Various parts witnesses water-logging. The maximum temperature recorded today was 29.0 degree Celsius while the minimum was 24 degree Celsius. Yesterday, the maximum temperature was 34.2 degree Celsius. Weathermen have predicted showers in the next 24 hours. Dhaliwal said as compared to last year, the state had received 59 per cent less rainfall between June 1 and July 31 this year. The humidity level went up following the rain. The state government is yet to recruit non-teaching staff at the Senior Secondary School for Meritorious Students. The academic session has already started at the school. The school does not have any non-teaching staff, including clerks, librarian, library restorer, accountants and hostel wardens. The functioning body, the Society for Promotion of Quality Education for Poor and Meritorious Students of Punjab, had advertised the posts of non-teaching staff, along with the posts of teachers but, failed to fill these posts. The society recruited as many as 19 lecturers of all the subjects for the school in Ludhiana. Meanwhile, the Education Department gave the officiating charge of principal to Anoop Kumar Passi, principal of Government Senior Secondary School, Cemetery Road. The teachers and official staff from the Education Department have been working on ad-hoc bases in the school. The department is yet to recruit class IV staff. To add to the woes, the school is still deprived of the basic facilities. The teachers and hostel wardens at the school had a tough time as several students have caught viral diseases due to the changing weather conditions and improper residential accommodation at school. Shockingly, the government is yet to provide medical facility on the school premises. According to information, several students fell sick on the first day in the hostel itself. The students are content with the food provided in the mess but they are finding it tough to stay in halls and the newly-painted rooms. The school authorities have written to the Civil Surgeon to provide doctor, medicines and ambulance at the school. In the absence of proper medical facility, the school authorities have given permission to sick students to go home and come back once they have recovered completely. Meanwhile, as many as 12 more students took admission at the school on Tuesday. As per the revised state-level merit list, the students who had filled Ludhiana as second option have been sent here. Five students got admission in commerce, one in medical stream and six in the non-medical stream. Several students have caught viral infections due to the changing weather conditions and improper residential accommodation at the school. Shockingly, the government is yet to provide medical facilities to the students on the school premises. The school authorites have written to the Civil Surgeon regarding the issue and are awaiting a suitable response from the Health Department. The meeting of the Government Pensioners Association, Doraha, was held at KK Kaushal Memorial Bhavan, on Monday. Pawan Kumar Kaushal presided over the meeting. The meeting strongly condemned the harsh and callous attitude of the Akali-BJP government as far as the pleas of the pensioners were concerned. The association has blamed the Badal government from retreating from its promises made during the Lok Sabha elections to implement the demands of the pensioners. The pensioners are demanding the immediate release of the installment of DA, which is pending since January 2014, arrear of DA at 10 per cent for the period of July 2013 to January 2014, facility of cashless treatment to the pensioners on the pattern of the military personnel as announced in the budget session in February 2013. In a special resolution, the meeting condemned the Punjab Prevention of Damage of Public and Private Bill-2014, which was passed in the assembely. They alleged that the bill debars the people of their democratic right to protest against the injustices done with them. They stated the bill draconian, colonial and anti-democratic. It is also against the spirit of the constitution under which we have been provided with the freedom of speech, protest and other liberties, said the association members. They urged the government to withdraw this anti-people and undemocratic bill. The meeting also appealed to the governor of the state not to sign the bill. It was decided to participate in rallies to be organised by the Pensioners Joint Front at Patiala on August 14 and Talwandi Sabo on August 17. Gurdial Dalal, secretary, Government Pensioners Association, Pritam Singh, vice-president, Darshan Singh, Piara Singh and Pritpal Singh Jaipura gave their views in the meeting. Many waterborne diseases such as giardiasis, cryptosporidiosis, hepatitis A and E viral infections (jaundice), leptospirosis, typhoid, cholera and food poisoning occur due to consumption of contaminated water in the rainy season. This was stated by Dr JPS Gill, director, School of Public Health and Zoonoses, Guru Angad Dev Veterinary and Animal Sciences University. Waterborne disease is dominated by pathogens transmitted by the faecal-oral route and by drinking water. These diseases in infancy can lead to systemic immune system imbalances, increasing stunting and reducing cognizance. Experts from the School of Public Health and Zoonoses advised the public to take care of their health in such climate conditions. During the season, blockage and overflow of sewage pipes is a major source of contamination of drinking water supply. From reel to real: Gen Y goes retro in style! Fashion never dies. Seeing youngsters dressed up in polka dots or floral shirts nowadays, take you down the memory lane. 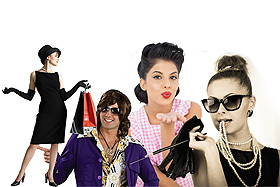 Retro fashion is back with a bang and how! With the old-is-the-new trend, residents seem to have accepted the trend with open arms. Go to the market and you will come across clothes that used to be in fashion in the days of yore. Gurinder, a student at PAU, said polka dots and floral shirts have a high attraction quotient. “I have seen actors wearing such shirts in old movies. I was surprised to see the same in a mall. I immediately brought one. It is such a refreshing new trend,” he said. Another student, Luvish, said, “I had saw my grandfather’s photograph in an old family album. It was great to see a similar polka-dotted shirt at a fashion store. “I took that shirt and went home wearing it. Both, my father and grandfather, were pleasantly surprised and recalled their old days,” he said. “I am not longer a fashionable person but, I am still going to get this polka-dotted shirt that I saw a youngster wearing recently. I had a similar shirt once,” he added. Teej festival was celebrated at Government Primary School, Garhi Fazil, on Tuesday. The chairman of the School Management Committee, Nirmal Singh Sarpanch, and other members of the committee were present of the occasion. Students also participated in a cultural programme. Residents of Garhi Fazil village appreciated the efforts of the management. Students of Holi Path School, Kakowal road, celebrated ‘Teej’. School premises were decorated with flowers. Students participated in giddha, bhangra and sang songs. Winners were given prizes. Students of Kiddies Paradise School, Kochar Market, welcomed saawan and celebrated Teej. School was decorated with make-shift swings and colourful traditional paintings. Articles displaying Punjabi cultural heritage added all the more charm and glamour to the Teej celebrations. Girls presented a giddha performance on the occasion. Traditional dishes were also served and school principal Taranjit Kaur highlighted importance of the festival. The Management Committee of tMaya Devi Goel Public Senior Secondary School felicitated meritorious students during a function at Pohir village, near here. Chandar Kala Panth, principal, said the committee has felicitated outstanding students who brought laurels to the institute during competitions held by the East Sahodya School Complex recently. Kajal and Aditya Joshi were among the winners of poetical recitation held at Swami Chhagan Lal Lala Hans Raj Jain Public School, Khanna. They expressed their views on self-confidence and childhood, respectively. A rakhi-making competition was oraganised by Guru Nanak Public School, Model Town Ext. (Primary Wing), for students of Classes I to III. Children brought their own material and used their creativity to make rakhis. Rakhis were made using ribbons, glitters, cartoon pictures and mirrors. Starcast of an upcoming Punjabi movie ‘Aa gaye munde UK de’ visited the city recently. Actors Jimmy Shergill and Neeru Bajwa visited PVR at the Silver Arc Mall and Pavilion Mall. Shergill said the movie is a sequel to Munde UK De. The story of the upcoming movie has a fresh beginning. Those who have watched the first part will love the sequel and even those who have not, will equally enjoy the movie, said Shergill. It is a light-hearted humorous, romantic and entertaining movie, he added. Bajwa said she plays a character of a bubbly girl named Disha in the movie, opposite Shergill. City-based advocate Harpreet Sandhu welcomed the actors during their brief visit to the mall. Youths present in the mall took advantage of the opportunity and clicked pictures with their favourite stars. Due to tight security, however, a few of them could not get their pictures clicked with the popular actors. A team of officials from the building branch of the Municipal Corporation (MC) today removed shutters from two under-construction shops in the upmarket commercial hub of Ghumar Mandi. According to Monica Anand, Assistant Town Planner (Zone D), a portion of a residential building in Ghumar Mandi was being converted into shops. The owner of the building was served with a notice for violation of building bylaws and unauthorised change of land use a couple of months ago and he had assured officials that no further construction would be taken up and the part of the building would be restored back for residential use only. “However, the owner of the building continued with the construction work and shutters were being fitted to the shops when the field staff of the MC intervened,” Monica said, adding that further action as per rules would be initiated for illegal change of land use and violation of building norms. In the wake of communal violence at Saharanpur, representatives of different religions gave a message of unity and peace during a conference at Guru Nanak Bhawan. A brief spell of rain lead to the accumulation of rainwater in various areas of Jagraon today early morning. There has been no relief for residents of the town from the problem of waterlogging during the rainy season. Almost all the areas of the town get flooded with rainwater every time when it rains thus causing a lot of problems to the local residents. During a visit to different parts of the town after the rain, it was found that many feet rainwater had accumulated on various roads as well as streets of residential areas. The worse hit areas were Lajpat Rai Road, Sabzi Mandi Road, Kamal Chowk, Sadan Market and Rani Jhansi Chowk. A lot of rainwater had accumulated in these areas thus forcing some of the shopkeepers to even close their shops. In some of the areas, including Old Grain Market, the rainwater even entered some of the shops and damaged goods stored there, causing a lot of financial loss to the shopkeepers. Being located in relatively lower part of the town, Old Grain Market often ends up as being the worst affected area. The shopkeepers of the Old Grain Market always complain of incurring financial losses as the rainwater often enters their shops and stores, thus damaging the goods stored by the shopkeepers there. Every time when it rains, the shopkeepers have to toil to save their goods from the rainwater. Though, the local Municipal Council always makes tall claims of being fully prepared for the rainy season but every time these claims fall flat when it rains. The present rainy season once again exposed the tall claims of the Jagraon Municipal Council about its preparedness to prevent waterlogging during the rainy season. There are two major reasons behind the problem of waterlogging. Firstly, most parts of the town are developed in an unplanned manner. Meanwhile, lack of proper drainage system is the second major reason behind this problem. Besides this, drains are also not cleaned properly which chokes the sewerage and the flow of water. The local residents feel the problem could be solved if the drainage system is improved and the drains are cleaned properly and timely. Jagraon Municipal Council, executive officer, Davinder Toor claimed that the civic body was fully prepared to prevent waterlogging during rains. “All the drains were cleaned properly prior to the rainy season and we have also improved the drainage system. But despite our efforts, the rainwater still accumulates in some lower parts of the town and that is because most of the city is developed in an unplanned manner,” Toor said. Most awaited rains have not been really welcomed by the residents at Mandi Ahmedgarh and surrounding localities as life was thrown out of gear in the morning with many residential areas and administrative offices, including the local municipal council office, sub-registrar’s office and the police station, being flooded due to recent showers. The situation has exposed the ill-preparedness of the civic authorities. However, civic body authorities claimed they had made extra arrangements to cope with future situations. Life came to a standstill in the morning, when the heavy rain flooded the low-lying areas, including the Guru Nanak Pura, Jawahar Nagar Area, Mahavir Road, Dehliz Road, Gandhi Chowk, Bhagat Singh Chowk areas and Amarpura Mohalla. Though, contractors deployed by the civic body had been desilting major lines of the sewerage system, inadequate infrastructure seems to have resulted in harrowing time for the residents. Pedestrians, including students and female employees of various organizations, were the worst sufferers. Traders of the town were also disappointed due to varied reasons. While their shops were opened late in the day, customers turned out in lower numbers in the afternoon. Water had entered many shops situated along the Railway Road. Solid waste disposal was also affected adversely due to flooding of streets and roads. Stinking garbage heaps lying on the outskirts of the town worsened proved problematic for passerbys and residents of surrounding localities. The residents had urged the higher authorities to impress upon the municipal council authorities to expedite the cleaning and strengthening of the sewerage system. The Chief Medical Superintendent of Northern Railway, Ferozepur, has revealed that the railway pensioners are now entitled to yearly medical check-up. This has been revealed to the Northern Railway Pensioners Welfare Association under the RTI Act. Resounding the RTI, the Chief Medical Superintendent of Northern Railway, Ferozepur, informed that the medical examination of all retired employees was done on yearly basis but if anybody was suffering from any problem they were not allowed to contact the authorised medical officer for getting the complete medical examination any time. The Chief Medical Superintendent further informed that the authorised medical officer could only do the basic health check-up and refer the patient to a specialist at Divisional Hospital. “If some serious aliment is found, the patient can be sent to Central Hospital in New Delhi or to a private recognised hospital on the discretion of the authorised medical officer,” the CMS added. For the recruitment in Indian Army 17,200 youngsters participated at Dholewal Army Recruitment Office. After a medical test 2,100 were selected for written test. The written exam will be held on August 31at HVM Senior Secondary School, Karamsar Colony, New Subhash Nagar, Basti Jodhewal, Ludhiana. Number of organisations including Kirti Kissan Union, Democratic Employees Front, Karkhana Mazdoor Union will be staging a dharna on August 11 against Public and Private Property Damage Prevention Bill 2014. Representatives of the above organisations said that though the government says that the bill is to safeguard private and public property but in reality they want to curb the voice of truth. A meeting of Bhartiya Janta Party, CA Cell, and was decided to request the extension of implementation of New Tax Audit Forms to the next financial year. The meeting was chaired by Rajeev K Sharma, District Convener, BJP CA Cell, Ludhiana. The office bearers of Municipal Sanitary Inspector Association, Punjab, submitted a memorandum to Commissioner, Municipal Corporation, Ludhiana, here today. The Municipal Sanitary Inspector Association Punjab urged the Commissioner, Municipal Corporation to address their long pending demands. The Chief Sanitary Inspectors and Sanitary Inspectors have been demanding to revise their pay scale and promotions. The Samrala police with the help of officials of milk plant Ludhiana have unearthed a big scam. The police booked two persons. The alleged accused were daily stealing about 1,700 litres of milk from the tanker and mix water of the same quantity and this practice was said to be continuing from last about three years. The alleged accused were identified as Jagpal Singh, driver, a resident of Ghulal village and Karamjit Singh, a resident of Chamkaur Sahib. The matter came into light when a team of officials checked the tanker near Samrala. They found a secret small tank made in the tanker where they stored 1700 liters water daily and after entering milk plant they first gave sample of pure milk and later they dump water mixed milk into the milk plant. The team members after finding irregularity called the police and Samrala police had registered a case in this regard against above said persons under Sections 420, 380 and120-B of the IPC but they are at large. DSP Jaswinder Singh confirmed the incident. He said a case has been registered on the complaint of Anil Kumar Mishra, deputy director, Milk Plant. He said the alleged accused are still at large and the police parties are raiding their hideouts to arrest them. Meanwhile BKU President Balvir Singh Rajewal had demanded through probe into this matter. He said that this big scam could not take place without the hand of some influential person or persons and the real story behind this big scam should be brought to book. He said he will take up this matter with CM to find the truth and to stop the fraud with the thousands of consumers of Milk Plant. Only two days after being released on bail in an illegal liquor smuggling case, a Jagraon-based youth was again arrested along with his other three accomplices by the Jagraon police for allegedly smuggling illegal liquor. The police have seized 27 boxes of illegal liquor from the accused. The accused have been identified as Narth Singh, a resident of Kothe Khajuran village near Jagraon, along with Parminder Singh, Harjinder Singh and Jagvir Singh, all the residents of Jagraon. As per the information, the accused were arrested by a police team led by ASI Teja Singh from Disposal Road area of Jagraon late last evening. The police have also impounded a Maruti car (PB 10 Q 3000) in which the illegal liquor was allegedly being smuggled. According to Jagraon City Station House Officer (SHO) Bikramjit Singh, a police team led by ASI Teja Singh was patrolling on the Disposal Road area when they saw a white Maruti car coming from Sugar Mill side. “On seeing the patrolling party, the persons travelling in the car reversed it and tried to flee. The police team gave them a chase and nabbed them at some distance. When searched, the police recovered 27 boxes of illegal liquor hidden in the car,” staion house officer Bikramjit Singh informed. Following this the police arrested all the four accused and seized the illegal liquor recovered from them. The police have registered a case against all the four accused under the Excise Act at Jagraon city police station. It is pertinent to mention here that one of the accused Parminder Singh was arrested by the local police along with 50 boxes of illegal liquor on July 31. He was released on bail only two days ago. The Khanna police booked Sher Singh, sarpanch of Bibipur village, on Monday on the complaint of a woman panch. Manjit Kaur, panch of the village, said she was empowered by the village panchayat including sarpanch to look after the work of the MGNREGS in the village. She stated that on June 6 she was told by village Sarpanch to come to his house in the late evening to collect forms of MGNREGS. When she reached in the house of Sarpanch he was alone in the house. Manjit alleged that Sarpanch tried to molest her but she managed to escape. After reaching her house she narrated her tale to her husband and later they lodged a complaint and the police registered a case under Sections 354, 354-A. The police are conducting raids to arrest the sarpanch who is at large. SSP Khanna said they had received a complaint in this regard and the police after verification by a DSP had registered a case. Three players from the Harvest Tennis Academy (HTA), Jassowal, Ludhiana district, competed in an international tennis tournament held in France, recently. Jajbir Singh, Hardeep Singh and Dalwinder Singh spent three weeks in France taking part in the French Federation International Men’s Tournament and played on various surfaces. Tour leader Touzet said the boys had a hectic tour as they had to play up to three matches a day. But at the end, these players realised that such match pressure and exposure had made them stronger and more confident. “They realised that if we are not physically and mentally prepared, we will not be able to sustain the daily competition level and much efforts needed to play at international level,” Touzet added. Hardeep Singh, who has recently won the title of the (U-18) All-India Tennis Tournament, surpassed all expectations in France by winning the men’s singles title at Treviere. Sharing his experience, he said he was so happy to bring two titles to Jassowal and HTA. “Playing against some established players drawn from different parts of the world was a great experience. Earning ranking points at such a high level tournament would help a lot to perform better in future tournaments,” they opined.